The Supermicro SC513F-350B case has the IO ports at the front instead of the rear. The item may be a factorysecond or a new & unused item with minor defects. An item that has been previously used. An item that does not function as intended or is not fully operational. 2X E2620 CPU FITTED. MOTHERBOARD X8DTN . Supermicro SuperChassis CSE-846. However we may use our discretion also to provide the safest and best service. UK, longer for all other areas! Right of cancellation does not apply to audio or video recordings or computer software if they have been unsealed. Model: SuperMicro CSE-846, X8DAH -F, 846E1-R900B. Form Factor: Rack-Mountable 4U. A forklift is not required. All of our servers are refurbished to a very high standard. Internal parts (such as RAM and CPUs) are tested individually, and once the components are installed the system is tested in full. QTY 1 x Supermicro 1U SYS-6017R-TDLRF server chassis. Server Systems. 2 x Removable 3.5" Hard Drive Caddys (Can use 2.5" adapters for SSD etc). We have a large inventory of spares, plus a database of trusted suppliers supporting systems from the last 25 years. SuperMicro P8SCT 1U Server with This 1U, Short-Depth server fits nicely in smaller racks. Full details can be found on the SuperMicro website here Ubuntu has been installed for testing purposes, but this server has been running Windows Server 2008 just fine. 8 caddy with screws included. We will resolve the problem directly with you. require 2nd sas to 4 port cable to connect top row back plane. Item Title. Supermicro SuperServer. Superb server. 4 x drive caddies. Fantastic condition. Supermicro 2U 8 3.5" Bay Server, 2 x 6 Core E5-2620, 32Gb RAM, Quad LAN, NAS! Based on a 2U chassis model SuperChassis 825TQ-600LPB fitted with a Supermicro X9DRi-LN4F (Image shows standard X9DRI-F which only has 1 2 LAN ports) motherboard, using a direct attach (SATA I/II/III & SAS1 / SAS2 compatible) backplane for upto 8 hard drives plus optical drive (and SATA DOM or SSD boot drive capability). Sold with 2 x 1U low profile heatsinks. X9DRI-LNF4 Dual socket Motherboard. QTY 1 x Supermicro 1U SYS-6026T-URF 2U 8 Bay 3.5" drive storage chassis. 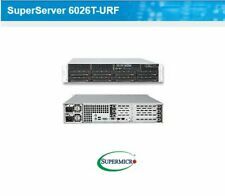 This is a Supermicro 6026T-URF 8bay Server. Dual Xeon L5630 2.13GHz. 20GB Ram (There is actually 24GB but one ram stick doesn't seem to work currently however it will still be in there). Supermicro SuperServer 6015B-T 2x Xeon Dual Core 1.6GHz 4GB. Model No: SuperServer 6015B-T. Ram 4x SAS Bays RAID. 4 x 3.5" SAS Bays UNPOPULATED - takes standard SAS/SATA/SSD. 2 x 2GB DDR2 ECC Ram. P/N: 116TQ-R700CB. QTY 1 x Supermicro 1U SYS-6016GT-TF GPU chassis. The systems have been refurbished and 3 x 3.5" drive trays are included plus rack rails. 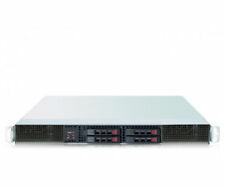 Servers Supermicro 6014P-8R 1U Superserver Black. Form Factor 1U Rackmount. Keyboard / Mouse Included No. Colour Black. Back Panel 2. RAID Support SCSI. Storage Drive Included No. Graphics Interface PCI. The item may be a factorysecond, or a new & unused item with minor defects. An item that has been previously used. System has enough power and slots available to support 2 GPU or Xeon Phi style cards. Refurbished Supermicro 3U Dual GPU Server. QTY 1 x Supermicro 3U SYS-6037R-72RFT server system. 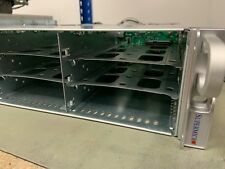 Supermicro 2U 8 Bay Storage Server, barebones, built to any spec or buy as is. We will build to any spec, or you can buy as barebones. QTY 1 x Supermicro 1U SYS-6026T-URF 2U 8 Bay 3.5" drive storage chassis. Systems do include 8 x 3.5" drive trays but an optional 2U railkit is not included. Storage:Unpopulated( 2x 2.5" HDD Bays (No Caddies Included) ). Hitachi P/N: SX320158-04. 1 x MFB1100 Module SC315033-03 With. (All you need to add is CPU, RAM and HDD for a complete server. -Storage: 10x SFF drive bays No HDD installed, 10x caddies included). 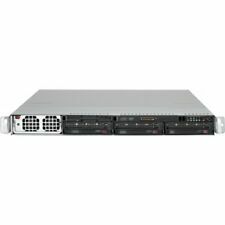 Supermicro 2U 8 Bay Server, Dual E5 CPU, 32GB RAM, Upgradable, QTY available. Based on a 2U chassis model SuperChassis 825TQ-563LPB fitted with a Supermicro X9DRi-F motherboard, using a direct attach (SATA I/II/III & SAS1 / SAS2 compatible) backplane for upto 8 hard drives plus optical drive (and SATA DOM or SSD boot drive capability). NO RAM NO CPU 2U Rack Server. Supermicro CSE-826 X9DRi-LN4F 2. no rail kit. We will resolve the problem directly with you. SuperChassis 847E1-R1400LPB (Black ). E1: Expander supports SAS. HDD Backplane supports 36 SAS hard drives (24x front 12 rear). Storage - 36 x 3.5" SATA/SAS Hot plug Drives Caddies (no drives included). COA - Windows Server 08 R2 Standard 1-4CPU 5Clt Attached (Not Installed). Processor - 1 x Dual Core i3-2120 3.30GHz CPU. Chassis Model: CSE-813M. Optical Drives - None. Model Sun Fire X4540. Mainboard Type Sun X4540 Motherboard. CPU 2x Six-Core AMD Opteron Processor 2435 2.6 GHz. Rack rails are not included. There are no hard drives or ram installed. Mains cables are included. Processor Support. CS 207303 207304 207305 a 2x hs 24x cad. Storage - 24 x 3.5" backplane with 24 x SATA/SAS Hot plug Drives Caddies (no drives included). SATA 2.0 3Gb/s with RAID 0, 1, 5, 10. SATA 3.0 6Gb/s with RAID 0, 1, 5, 10. 2 x Xeon E5620 2.40GHz octa-core. 64GB ECC RAM and plenty of ports - ideal for ESXi or similar virtualisation. 1 x SuperMicro AOC-SG-I4 quad 10/100/1000 ethernet (6 total ports). No software included although installed Windows 2012 Server Datacentre without key for testing. Details from Supermicro 9x USB 2.0 ports (4 rear, 4 via header 1 Type A). Integrated IPMI 2.0 and KVM with Dedicated LAN. 8x SATA2 and 2x SATA3 ports. Expansion slots: 1 (x16) PCI-E 3.0 and 4 (x8) PCI-E 3.0 slots.